It is not acceptable to ask a horizontal reduction of all European policies because some of them cannot work with less money. This is what Ivailo Kalfin said, a Bulgarian MEP from the group of Socialists and Democrats in the European Parliament in an interview with euinside. Mr Kalin is one of the two rapporteurs of Parliament on the negotiations on the multiannual financial framework for the period 2014-2020, which have again reached a dead end. 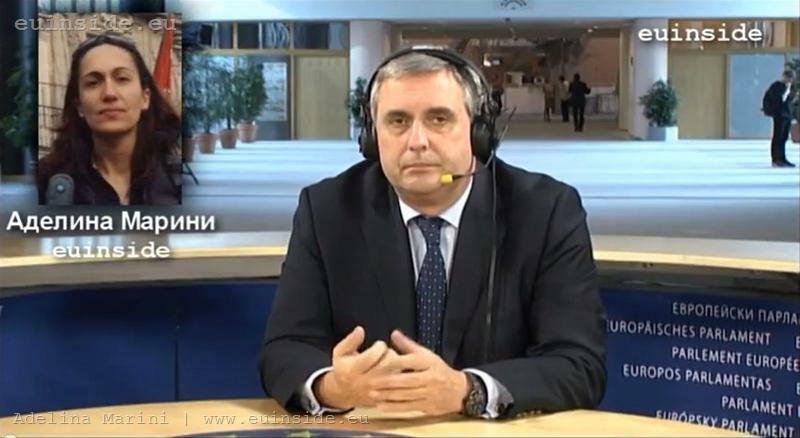 The MEP said this when asked to comment on the statement of Bulgaria's EU Funds Management Minister Tomislav Donchev, also in interview with this web site, that if it came to overall reduction of the EU budget, this to be applied to all policies not only the Cohesion Policy, about the reduction of which Bulgaria is not inclined to make a concession. Ivailo Kalfin specified that the European Parliament position is all major EU policies to be reviewed again thoroughly and to insist them to receive adequate funding. At this stage, the size of the budget is in the centre of disputes at European level and the European Parliament has so far maintained the position that it will block the budget if it came to reduction of the overall size. Ivailo Kalfin said, however, that the Parliament cannot force the member states to keep or increase their contributions. He recalled that the impact would be tough. "If the Council insisted on reducing the European budget, then it would have to review all its policies and probably to decide some of them to be left out", the MEP said, adding that the Council was not much inclined to accept this. Regarding the Bulgarian government's plans to introduce changes aimed at better preparation to absorb EU funding in the next programming period, Ivailo Kalfin commented that there was logic in the idea the EU funds managing bodies to be taken out of the public administration because that would allow wages to be increased. He called, however, on more clarity if that was the reason or there were others for such an idea. Regarding another proposal, according to which the number of projects to be financed with EU money on a competition principle to be reduced, the MEP recommended the government to think how to help raise the administrative capacity of small municipalities which are endangered by the competition principle not to receive projects, rather than taking them out of competition. He also warned that a large part of the projects and tools the Commission proposes, if left in the same form as now, will put the entire nation in a much more competitive environment in Europe. In September, the European Commission came up with several proposals, aimed at deepening integration, especially that of the euro area, in which President Barroso spoke of a federation of nation states in his annual state of the union address in the European Parliament. On this occasion, Mr Kalfin was sceptic, saying that the foundation of the new architecture is already put with the report of the four presidents. He underscored, however, that there was a danger the proposed framework to focus on the eurozone only. Ivailo Kalfin agrees with the proposal for enhancing the European political parties but said that the European parties should not take away functions of the national ones. The entire interview with the MEP on the important issues of EU agenda you can watch in the video file. euinside: The last round of negotiations on Budget 2014-2020 ended in September, if I'm not mistaken, with a trend for reducing the overall size of the budget. The Commission is firmly against that. The Parliament announced some time ago that it would block the budget if that happened. So, at this stage we have a stalemate. But are there conditions that would allow the Parliament to concede? Ivailo Kalfin: In the end of the day, the Parliament cannot impose on member states whether they should keep or increase their contributions. But we would like to make it clear what the implications would be. First, the implications will be extremely bad for the entire economic situation in Europe and, second, what the Parliament said in previous positions is that if the Council insisted on reducing the European budget, then it would have to review all its policies and probably to decide some of them to be left out. Something the Council doesn't seem inclined to do. euinside: Do you have any particular policy in mind that could be left out? Ivailo Kalfin: There are various ideas that are being shared. All of them go to the extreme. Starting from termination of co-financing of large projects, such as the project for nuclear fusion ITER or closing down EU agencies, or this is how some of the colleagues view the reduction of policies. euinside: And how would you comment in this sense the position of the Bulgarian government, expressed by Minister Donchev, and it is quite similar to what you just said, that if it comes to overall reduction of the budget this should be applied to all policies not only the Cohesion Policy as was discussed until recently? Ivailo Kalfin: I would share a much more reasonable opinion than that of Minister Donchev on the issue because the Cohesion Policy is not the only EU policy. The Parliament is entirely against a horizontal reduction of all policies. In other words, if they want a 100 billion cut and if all policies are reduced proportionally with that amount, this is unacceptable because there are policies which cannot work with less money. This is why the Parliament's position is that once again all policies considered major for the EU should be reviewed to see which of them should receive adequate funding. So, I think Mr Donchev's idea will not meet support everything to be cut, not only the Cohesion Policy. In other words, all the policies will be reduced but not with 1%. euinside: Do you find it acceptable to additionally reduce the initially proposed cap on Cohesion Policy instead of 2.5% to 2%? euinside: I can tell you that the Bulgarian government takes this issue very seriously and at the latest discussion in the General Affairs Council the Bulgarian side expressed the position that differentiated ceilings should be introduced for individual regions. Ivailo Kalfin: OK, but have you seen calculations how would this ...? Ivailo Kalfin: I haven't either and this is the problem. By the way, in the last negotiating box the Cypriot Presidency proposed, there is one exception - in parenthesis there is a text after the limit of 2.5% of GDP, saying that in exceptional cases, significant decline of GDP, this limit might not be taken into account. Such is the example of Lithuania, the economy of which lost some 20%. euinside: But isn't there a danger some countries with constant inability to generate growth to take advantage of this? Ivailo Kalfin: To take advantage of what? I think that this limit contradicts to any economic logic in the first place because when there are difficulties, it is the regions that have to be supported, public investments to be made that come through the European budget. I really cannot understand the existence of any ceiling but this is one of the things many countries insist on. euinside: Let's go for a while to the national level, after we mentioned the Bulgarian positions and I will again quote you Mr Donchev's words because he said that in an interview for euinside recently, in which he announced that several institutional changes are planned, like for example the Eu funds managing bodies to receive special status and to even be raised to the level of executive agencies. The objective is to ensure better flexibility because the public official status suggests many restraints. How do you find these ideas? Ivailo Kalfin: This seems to me a very complex thought, the meaning of which I don't know. If Mr Donchev has in mind the people who work on EU funds to be taken out from the public administration in order for their wages to be raised, there is logic in this because you know the entire drama with the double wages, then abolished by the current government, then again changes, etc. This is indeed very tense and highly qualified job for which it is very difficult to find people with proposals for little money but here again comes the big question of the incomes in the administration - should we separate them in such a way or not? So, probably Mr Donchev should explain why precisely does he want to take them out of the ministries - in order to raise their wages or for other reasons? euinside: Let's hope he will. He is not very specific in his statements on another issue as well and he even said he wouldn't explain it and it is that by the beginning of 2014, which is the beginning of the next programming period, Bulgaria will be ready to absorb money from the new budget almost at 100%. But two major areas will be left unprepared. He did not mention which areas these might be. Do you have any suspicions about them and do you share this optimism of the government that we will be ready to absorb at full speed? Ivailo Kalfin: I'm again afraid that I have to express a different opinion. I think that what Mr Donchev said is quite not serious and I will tell you why. It is still unknown what the legislative basis will be, what the legal foundations for the separate programmes will be. At the moment negotiations are taking place, they are expected to end on the general numbers but then the Parliament will begin to negotiate with the Council precisely on the legal foundation. So, this process will probably end in the spring of next year at the earliest. So, I don't know how could have Mr Donchev foreseen from now how will the negotiations end between the Parliament and the Council and what conditions will be adopted and how Bulgaria will prepare for them. euinside: Do you think that the negotiations should end and then we should start thinking what to do? Ivailo Kalfin: No, no, we have to be thinking already and to take part in the negotiations because I would not underestimate the negotiations on the legal foundation. Because in the European budget it is not about money only, it's about the way these funds will be spent. I will give you just one example - the proposal for compensations for Kozloduy, for instance, where under a proposal by the Commission we are deprived of any independence and everything goes to manual control by the Commission and it is not allowed to make any spending outside the plans for taking out of exploitation. So, the various programmes change in various ways, we should have a position from now. To negotiate for it and after all to see in the end of the negotiations what can be adopted additionally. euinside: And how do you find the idea the projects that will be selected on a competition basis to be limited in order to avoid, again in Mr Donchev's words and I think that with this question I will conclude with Mr Donchev, the smaller communities to remain without projects? In other words, to create a package of predefined projects. The idea is to create certainty for the local authorities to prevent the smaller municipalities that are not very competitive to remain without projects? Ivailo Kalfin: There will be such projects, I mean such amounts of money will not be much less and if there is a problem with the administrative capacity in the smaller municipalities Mr Donchev should address that and think about how the state can help them raise that capacity not to protect them from competition. Moreover, a large part of the projects and the instruments the Commission proposes, if adopted, Bulgaria will have to compete with entire Europe. So, in this sense, even our bigger municipalities should come out to a common ground together with the developed Western nations and to present better projects. The lath is expected to be raised really high. euinside: But this principle of competition should be maintained, shouldn't it? Ivailo Kalfin: No, no ... in any case there will be more competition from now. There will probably be a part, as it is now, funds that are allocated for a country if it sticks to the conditions, to spend them. But anyway, we have to prepare for much stronger competition and this does not happen with opposition and kicking but with adequate preparation in the country. euinside: I will return to the European level again. How will you comment on Barroso's proposal in his annual address talks to begin about a federation of nation states? euinside: It seems he did not dare specify, he just insured himself saying that he did not speak of a super state whatever this might mean. Ivailo Kalfin: Well, yes, because there are many contradictory opinions in the EU but in the end of the day someone has to name the problem and start solving it. This is to some extent seen in the letter sent by Mr Van Rompuy and written together with the ECB president, the eurozone president and the president of the European Commission. It is there that the new architecture is being drawn, what they imagine for Europe. It is it that should make us think because there are risks this framework to focus on the euro area only. euinside: Yes, there are such risks and by the way Barroso was talking about, quite generally again, that there must be, how did he call it - a 17/27 dimension - which should probably change to 17/28 dimension next year, but it is not clear to what extent this proportion will be guaranteed. He emphasised a lot on the idea of creating a European public space and in this regard there was another proposal for a change of the regulation for the European political parties, including that the European political groups to nominate candidates of their own for European Commission president. How do you interpret these things? Ivailo Kalfin: This is a direction in which Europe must go. It should be gone toward more common European institutions but they should not be torn apart from national realities. I cannot imagine that the European parties can replace the national ones because there is no way this to happen. Here, we are talking more about a better cooperation between the national parties and this was seen at the congress of the Party of European Socialists and the party's ambition all participants in it, all member parties, to agree on a common position. This means that a European party does not take away functions of the national ones. euinside: And about the election of a president of the Commission, because there is a lot of talk about the lack of legitimacy, about violated democracy, etc. Will this ensure that democratic legitimacy? Ivailo Kalfin: What would make the election the most democratically legitimate would be a direct election of the European Commission president. euinside: By direct you mean by the citizens or? Ivailo Kalfin: Yes, but this does not correspond to the current treaty. This requires changes to the treaty. So, from that point of view, it is better for them to nominate candidates of their own not from the national interest perspective but from the common European interest perspective and the election of a European Commission president is definitely a step in the right direction but it will not change much the current situation.